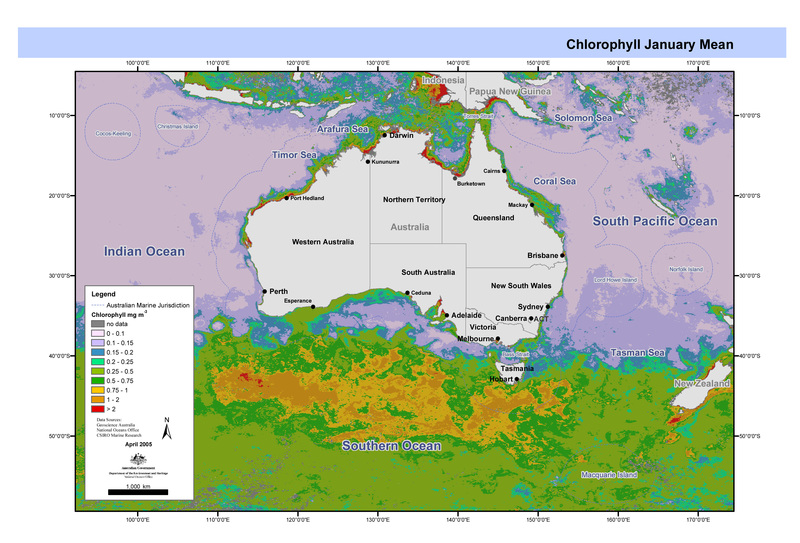 ESRI grids showing ocean chlorophyll from global observations of ocean colour data from the moderate resolution imaging spectroradiometer (MODIS). These grids have been produced by CSIRO for the National Oceans Office, as part of an ongoing commitment to natural resource planning and management through the 'National Marine Bioregionalisation' project. Chlorophyll accuracy is about ± 20%. Set of 4 maps showing quarterly means of ocean colour data from the moderate resolution imaging spectroradiometer (MODIS). These maps have been produced by CSIRO for the National Oceans Office, as part of an ongoing commitment to natural resource planning and management through the 'National Marine Bioregionalisation' project.